• but truth is that people who influenced Bhagat Singh most were Lala Lajpat Rain who was an Arya Samaj and Veer Savarkar who was are staunch supporter of Hindutva thoughts. • Bhagat Singh himself published and distributed the copies of the book written by Veer Savarkar ‘The Freedom Struggle of 1857’ among the freedom fighters and the youth. Bhagat Singh himself went to Ratnagiri and men Veer Savarkar to seek permission to print the book. 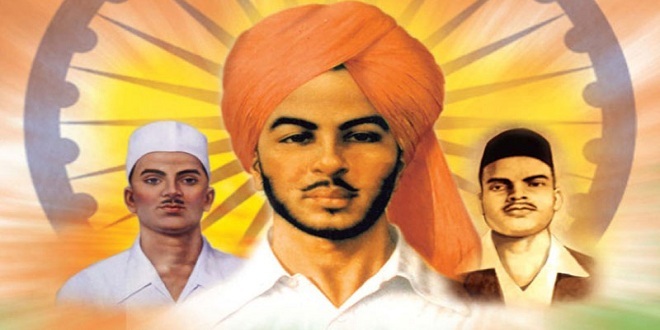 · Arya Samaj had a special relation with the life of Bhagat Singh. The founder of Arya samaj Rishi Dayanand was born in Gujrat. His name was Mool chand. When he offered his life for the service to the Nation and the society after he became sanyasi, he adopted the name as Dayanand. He toured the entire country. In Bengal he met Swami Ramakrishna Paramhans and Keshav Chand and from there he went to Punjab. Bhagat Singh’s niece Vierndra Sandhu wrote “Sardar Arjun Singh (Grand Father of Bhagat Singh) met Swami Dayanand and influenced by him. After listening his speech, he joined the Nav Jagarn Sena and became Arya Samaji. Skh Educational institutions were controlled by The Kings and the LandLords so he got is elder son Kishan Singh admitted in Saidas Anglo Sanskrit High School in Jalandhar and he himself started living there and worked as an assistant of Rayajada Bhagat Ram. The way of service to the nation and the society shown by Grand Father of Bhagat Singh was followed by his father Kishan singh also. It was in 1998, Barar(Vidarbh) was suffering with Famine and epidemic . Kishan Singh was then 20 years old. Arya Samaj formed Barar Relief Committee and Kishan Singh was given the responsibility to collect and distribute the relief material to the affected people of Barar efficiently, till the famine gets over. After two years i.e. in 1900 similar famine when attacked Gujarat, Kishan Singh opened a relief camp in Ahmedabad. In 1904 Kishan Singh was elected the secretary to the Relief Committee formed to the rescue and refief work for the Earthquake struck Kangara. In 1905 When Kashmir was crying for help due to the devastating floods in the river Jhelum, Kishan Singh reached there and started the relief work. (Bhagat Singh – a vivid History (life and thoughts) Writer Hansraj Rahabar, Edition 2018, Publisher – bhagat Singh Vichar Manch, Distributors; Sakshi Prakashan. Page 21,22,27. Life Imrisonment – (1) Kishorilal, (2) Mahavir Singh (who martyred of hunger strikefor 9 days in Andaman jail, (3) Vijay Kumar sinha, (4) Shiv Varma, (5) Gaya Prasad, (6) jaidev Kapoor, (7) Kamalnath Tiwari. Ajai Ghosh, Surendranath Pandey and Jitendra Nath Sanyal were freed. The Accused boycotted the Court; therefore, the judgment was delivered in Lahore /central jail. One can enjoy complete Ecstasy, only in death. The love from my heart to my motherland will not die with my death. The fragrance my country will emit from my aces. Sacrificing life on the altar of motherland alongwith Shahid e Ajam Bhagat Singh was Rajguru, his full name was Shivram hari Rajguru. He was born on 24th August 1908 in Kheda Gaon in pune Dist. Of Maharashtra. His life was full of struggle since the beginning at the age of 6 years his father expired. Elder brother Dinakar Hari Rajguru only brought him up. He faced extreme poverty in his childhood. At the age of 15 he left home and came to Varanasi. He studied Sanskrit living in very difficult situation. In this period, he camr into contacr of freedom fighters and went to Lahore, where he started working with Revolutionary front of Bhagat singh, Bhagavati Charan and Sukhdev. He was assingned to join the ploy along with Shiv Varma to shoot and kill one of the traitors living in Delhi, in the beginning to prove his sincerety. Sukhdev was born in Naughara village of Ludhiaya dist. Of Punjab. His father Ramlal Thapar belonged to a famous Political and social family. For his carelessness his friends used to call him a villager and he was like that. He will do anything comes to his mind without thinking of consequences. He read somewhere that anybody can be tamed by punching on his nose y. he went out to prove this. On the way he saw a man with stout body and without thinking of the aftermath he punched on his nose, the man became unconscious for same moment, when he came o his sense he started beating Sukhdev left and right but Sukhdev did not resist him. Passersby came to his rescue, but he stood unperturbed. When people asked him why he did tis and why he is not retaliating now and why he did not run away when the man was unconscious? He coolly said I just wanted to test that how long a man remains unconscious after my punch on his nose. After Saunders killing Sukhdev rescued Bhagat Singh and Rajguru safely and he himself ran away to Kanpur dodging the police. From Kanpur he went to Agra. Where he met Bhagat Singh again. They took training of Bomb making from Yatindra nath das. Sukhdev took on rent the Kashmir Building in Kila Gujar Singh in Lahore and started Bomb making factory. In jail also Sukhdev lived a jolly life. At last on 7th Oct. 1930 the judgment of hanging of Bhagat Singh, Sukhdev and Rajguru was pronounced. When people started agitating against the verdict, Sukhdev sent message that their hanging will be more fruitful to the nation than the changing of their sentence.